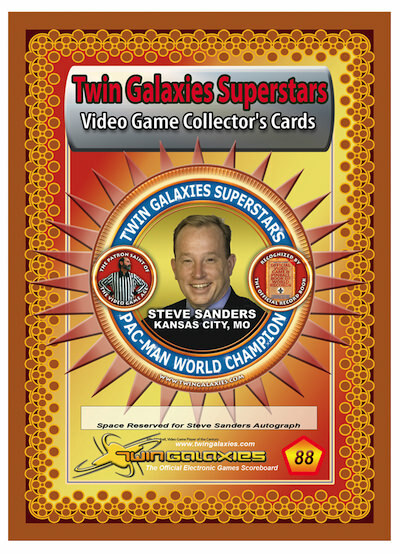 Our next Trading Card Spotlight features Steve Sanders who currently is displayed on card number 308, from the Superstars of 2012 Collection. He is also featured on cards 88, 127 (with Lonnie McDonald) and 328 (With his Son Isaiah). Steve is one of the original members of the Twin Galaxies community back in 1982. He can be seen on the famous Time Life Magazine photograph taken outside the original Twin Galaxies arcade opened by Walter Day. Steve has many world records in arcade history, including games like Donkey Kong, Joust and Super Pac-Man. He can be seen in the documentary, The King of Kong: A Fistful of Quarters, which is currently out on DVD. Steve wrote the book “The Video Master’s Guide to Donkey Kong” as a teenager back in the early 80’s and also competed on the “That’s Incredible” Arcade Championship as a top contender. Steve currently works as a trial attorney in Kansas City, Missouri. My first memory of video games is playing Atari’s Pong on a home console my parents bought for me in the early to mid-1970s. I was still in elementary school, so it would have been 1972-1974 time frame. A lot of effects and amazing graphics but usually very low gameplay. Most games are a one way path that you just have to move on straight. And there is more violence. Of course there are exceptions, such as my favorite Riven - The sequel of Myst, which is covered with great music. The technology helped the video games to become more impressive and more realistic. Most often without substance though. 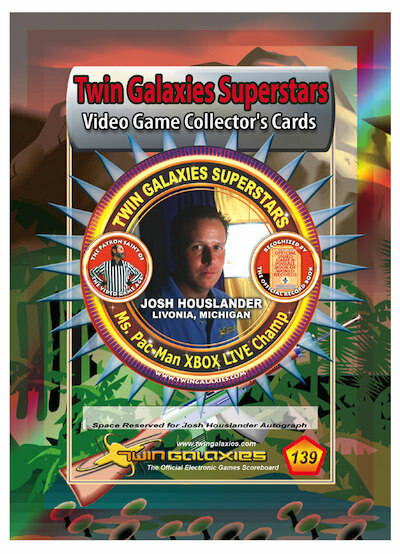 Our next Trading Card Spotlight features Josh Houslander who is displayed on card number 139, from the Twin Galaxies Superstars Collection of 2011. Josh was one of the creators of a podcast for Twin Galaxies website that discussed all things Twin Galaxies as well as world records established by the community. The new podcast which Josh is involved in can be heard primarily on themajors.net. Josh also was involved in an exclusive interview with Walter Day that can be purchased on DVD. Josh has also personally interviewed top talent in the video game industry through the years and was a key part of the Video Game Hall of Fame in Ottumwa, IA in 2010. Some of Josh’s Video Game Records include Bubble Bobble Plus on the Wii and Super Mario Bros. 3 for the NES. 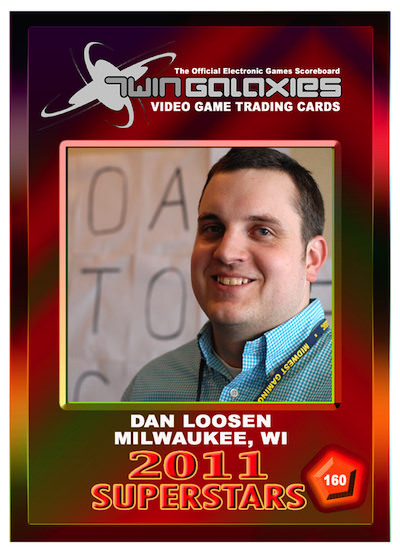 Did I ever think when I was younger that I would be on a video game trading card.....? Hmm, yes I probably did. My dream as a kid was to become an absolute video game master. I wanted to test my skills against all comers, I wanted to work in the video game field as a game tester, write up reports on the latest and greatest new games, and be the ultimate video game champion. At a young age I thought up ways to have potential tournaments, championships, and competitions to find out who the true "King of Nintendo" was (that is what I would have called it as a child). 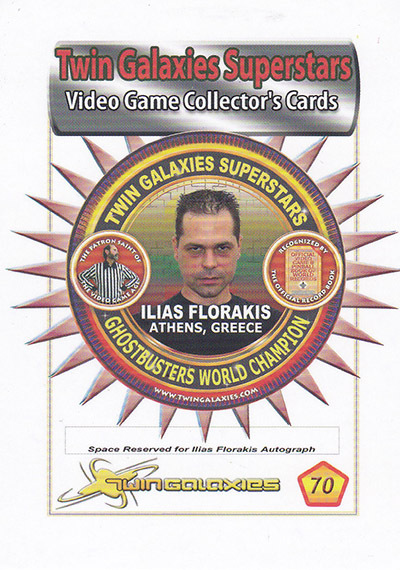 The only problem is, that if one were to go back in time and tell eleven year old Josh that one day he would be on a video game trading card; but that he would be remembered much more for covering events, podcasting, and his journalistic contributions to the subculture rather than his own world records or prowess as a master of all video games. That may just be one heartbroken little dork. Our next Trading Card Spotlight features Brett Weiss who currently is displayed on card number 221, from the Superstars of 2012 Collection. He is also featured on cards 227, 1193,1207,1320,1393 and 1402. These cards commemorate Brett’s books that he has written over the years. 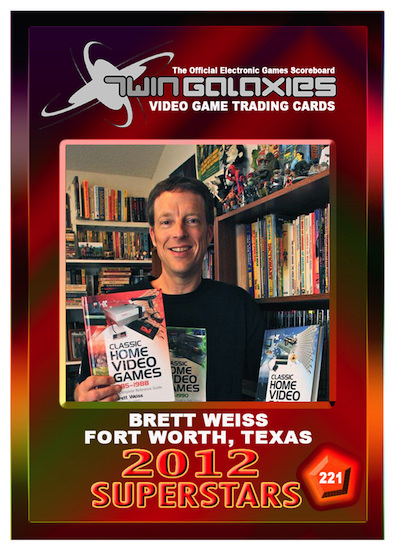 Brett is a passionate writer of many books and has contributed to numerous publications, including Game Informer, Video Game Trader and the PinGame Journal, to name a few. His well-known books, Classic Home Video Games can be purchased on amazon and other retail book sites. You can also find out more information about his work at www.brettweisswords.com. Do you remember your first video game/arcade you played and what do you remember about it? My brother and I played Pong at my cousin’s house in 1975—they had gotten it for Christmas. We were amazed that you could play it on television. Prior to this, I had played Gun Fight, Pong, and a few others in the arcades. When Breakout hit the arcades in 1976, I began liking video games even more than pinball, which I loved.